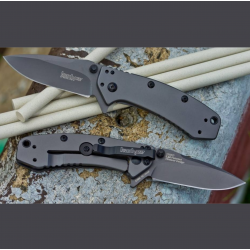 START A FIRE, EVEN WHEN IT'S WET OUTSIDEThis Kershaw Fire Starter strikes a spark—even in damp condi..
GET SOME SERIOUS BUSHWHACKING DONESometimes, bigger is better. It all depends on the job. That's why..
NOT JUST FOR ZOMBIES ANYMOREWhile it would be a lot of fun for our marketing department to sell the ..
NEW COLOR, SAME TOP PERFORMANCEThe popular Kershaw Camp 10 machete has been widely praised for both .. YES, YOU NEED ITYou know you need this tool.If you camp, backpack, hike, or hunt, you know you need .. THIS BLACK-AND-TAN FRAXION IS THE ONE YOU WANTThe Fraxion, from Kershaw and Danish custom knife and .. RUGGED, GENTLEMANLY, AND DEAD SEXYThis smaller pocketknife from Kershaw and Jens Ansø features a sli.. REVVED UP LOOKS, VALUE PRICEThe new Starter's design is machined and complex—yet smoothly functional..
GET A STREAMLINED LOOK AT A VERY STREAMLINED PRICELike the rest of this series, the Filter is named ..
ONE. COOL. WORK KNIFE.The new Kershaw Grinder is designed to be put to work.To that end, the Grinder..